My subject tonight is W. J. Phillips and his relationship to what might be called the mainstream of Canadian art. This is presumptuous of me. Winnipeg is, after all, Phillips’ home town in many senses; some of his family remain here and the city contains by far the finest single collection of his work. If I am ever to meet a critical audience on the subject of Phillips, it is certainly to be found in Winnipeg. This particular audience places yet another burden upon me. You are historians and I have often felt quite alone in dealing with art among historian colleagues. Most of my fellows, I have the feeling, are doubtful that art is really a proper subjectat least as compared to politics, diplomacy, labour, or the city. And, while 1 often feel defensive in the presence of my historical colleagues, neither have I felt comfortable amongst art historians, scholars whose methodology, purpose and inquiry are often far from my own. I address you on a topic of Canadian art history, therefore, with a pugnacity born of trepidation. My courage is bolstered, however, by good company, most recently by the well-known European historian, Peter Gay, whose At and Act appeared in 1976. While there is much in Gay’s book that I cannot quite accept, I find comfort in his sensible pronouncement that art “inhabits the same past as business, religion, or politics.”  Proceeding to look at art within a general theory of historical causation, Gay insists that a picture is just as much an historical event as an election, a war, or a strike, and that the fundamental problem in art which confronts an historian is why an artist painted the way he or she did. While that will be a concern of minethe exploration of the causes of Phillips’ artI wish to extend the enquiry to a broader question to which Gay does not address himself and yet is to me an even more important question, one that is both causal and consequential. Why did those pictures receive the reception which they have? What establishes and maintains an artist’s reputation? This second question, even more than the first, will be the burden of my discussion. Walter J. Phillips was born in Lincolnshire, England in 1884 and grew up in a number of English towns and villages as the Methodist ministry of his father dictated. While attending art classes near Birmingham he discovered the famous collection of David Cox and other early English watercolours in that city. As a youth of nineteen he went to South Africa, from which he returned after five years to find a position as art master at a school in Salisbury. After four years there, he emigrated, in 1913, with his wife and infant son to Winnipeg. He taught at St. John’s Technical School until 1924. During this time he painted in watercolour, experimented in etching, and in 1917 produced his first successful colour woodcut. He established a far-ranging yet modest reputation as a superb practitioner of colour woodcuts, especially after a sojourn in England fortified his connections with leading practitioners there. As a main marketing outlet was a New York dealer, he secured recognition in the United States as well as Britain. Aside from the trip to England, he remained in Winnipeg until 1941, the greater part of his mature period. During those 28 years his sketching grounds spread from Manitoba eastward to the Lake of the Woods and the Muskoka district of Ontario, and westward to the Rockies and coastal British Columbia. He moved to Calgary, then Banff, then Victoria where he died in 1963. In those years, certainly until failing eyesight halted his artistic work in about 1957, Phillips painted exquisite watercolours and produced woodcuts for which there are simply no equivalent in Canada. With this brief note behind us, let me turn to the first question of historical causation in art: Why did Phillips produce the pictures which he did? What causes moved him to adopt his style? What determined his subject matter? These are not, I think, complicated questions in Phillips’ case. He had been raised in an England which admiredas it still doesthe watercolours of DeWint, Cox, Cotman, and Turner. Phillips absorbed this English watercolour tradition as a youth and it always remained his primary point of reference. His mature watercolour style was akin to the contemporary developments of that tradition, whether reflected in Britons like Martin Hardie and Russell Flint or Canadians like F. H. Brigden and Franklin Carmichael. Tradition was a major theme in Phillips’ conception of art. It meant a great deal to him, and even (perhaps especially) when confronted by modernist movements which deplored its stultifying effects, he refused to view “tradition” as a word of abuse. It was this temperamental respect for tradition which, I suspect, inclined him toward his chosen media of watercolour and woodcut. The history and tradition that stood behind these made them attractive to him. With the watercolour tradition of England, Phillips combined the similar Japanese woodcut tradition of Hiroshige, Hokusai and Utamoro, artists of the great ukiyo-e school of colour woodcuts. Like his watercolours, he adapted it to a contemporary style comparable to other participants in the Anglo-American woodcut revival of his era. comparable, that is, to artists like William Giles, Allen Seaby and Eric Bergman. These chosen media of watercolour painting, the carved woodblock and the wood engraving which he often pursued as well, are all media which put a high premium upon skill and technique. They require patience, practice and craft. Phillips was absorbed and fascinated by craft. His critical writings abound with comments upon the technique both of early English watercolourists and of its contemporary practitioners, and his single published book was one devoted to an exposition of the technique of the colour woodcut. Absorbed as he was by process, he was not reactionary in its application: while submitting willingly to the limitations of the traditions in which he worked, he experimented with technical adaptations and sometimes stretched the wood medium to its practical limits. The love of natural beauty was always Phillips’ touch-stone and he easily transferred that passion to Canada. Though the colour and atmosphere were different, five years in South Africa had accustomed him to geographic variation and he found Canada itself diverse in mood, season and form. He became a sensitive visual and literary recorder of just these variations, whether at Muskoka or the Lake of the Woods, whether among city trees or over prairie distances, whether in the clear austerity of the Rockies or along the misty, sombre channels of British Columbia’s coast. A mood of gentle reverence, a love of intimacy, subtlety and tranquility pervades his sensitivity to nature. He loved nature’s understatement as much as her drama. While he revelled in spectacular sunsets, he found that the opposite sky disclosed a subtler beauty. One could easily miss the majestic clouds that rose in the East in a preoccupation with the western sunset’s blaze. A stranger might be impressed only with the monotony of the prairies, he once wrote, “but acquaintance reveals aspects of quiet beauty which never fail to charm.”  Similarly, the Lake of the Woods country was distressingly flat, but it possessed “a wealth of interesting detail that appeals with an intimacy which makes every object a possible shrine for beauty.”  Even amidst the dramatic spectacle of the Rocky Mountains he frequently turned his attention to the delicate and the intimate  the saxifrage, lichen, or fireweed in a swirl of mist. Let me cite a concrete example of this view of man and nature. So it was out of this temperament of tradition, this inclination to technique, and this quiet sensitivity to nature and to man’s place in it that caused Phillips to do his work in the way in which he did it. Without forgetting these, let me go on to the second question which an historian confronting art may ask. Why did Phillips’ pictures receive the reception which they didand do? First, of course, I must establish what that reception has been: what was and is Phillips’ reputation as an artist in Canada. I think it may be fairly said that Phillips never emerged as more than a minor figure in his lifetime and his reputation remains outside the mainstream of art historical scholarship and of art criticism in this country. While not conclusive, the handbooks of Canadian art tell us much. Newton MacTavish’s The Fine Arts in Canada, published in 1925, simply catalogues Phillips’ existence through the category of “others are ...” William Colgate’s Canadian Art, which appeared in 1943, does give him a generous paragraph, but Graham McInnis’ 1950 book of the same title reverted to MacTavish’s “others are” mention. More recently, he receives decidedly minor notice in J. Russell Harper’s Painting in Canada and Dennis Reid’s A Concise History of Canadian Painting names him only in connection with Winnipegers LeMoine FitzGerald and Charles Comfort. Charles C. Hill’s Canadian Painting in The Thirties misses him entirely. At least as significant, Peter Mellon’s lavish Landmarks of Canadian Painting does not include any of his work within that category. Terry Fenton and Karen Wilkin similarly omit him from their Modern Painting in Canada, upon grounds to which I shall refer later. Phillips is, of course, not totally ignored. He may be found in regional treatments, in a slight monograph published by Duncan Campbell Scott, the poet, in 1947, and in a recent National Gallery exhibition and catalogue by Michael I. Gribbonthough even that was mostly a circuit show, circulated only to small, usually western, galleries. While Phillips’ woodcuts command astonishing prices and are enormously attractive to small collectors, especially in the West, and to those who could not really be called collectors, Phillips was and remains outside the mainstream, a minor and peripheral figure in the establishment breviary of Canadian art. What accounts for this limited reputation? It is, I think, explicable on several groundspersonality, media, locality and artistic content and style. At a personal level, Phillips’ life and character were not such as lend them-selves to mythic treatment. The personalities and careers of Emily Carr and Tom Thomson allow heroic dramatization and have become intertwined with Canada’s own epic. David Milne, even A. Y. Jackson, led lives which can easily captivate the imagination. By comparison, Phillips was conventional, prosaic and pedestrian. He lived a normal, orderly, even bourgeois life, remaining happily married and supporting a large family. His chief recreation was bridge (at which, incidentally, he excelled). Phillips’ chosen media also hampered his reputation. He worked almost exclusively in watercolor, woodcut and wood engravingthe “minor media” of the 20th century. The bulk of his production is small works on paper He produced little in oil, certainly no big machines. While I do not myself sympathize with the general preference for oil and for size, and even less with art scholarship’s and criticism’s similar bias, such preferences are undeniable. Large and finished canvasses are “major works”, woodcuts are not. While personality and media were factors in keeping Phillips out of the mainstream, so too was locality The arts are metropolitan phenomena. In thinking of ballet, opera, music, art, and even literature, one must think in urban terms, for theatres, galleries, publishers, and the affluence that supports them concentrate in metropolitan centres. Phillips’ 1913 Winnipeg was Canada’s third largest city, but it was at most a regional city which could not rival Montreal, let alone the increasingly dominant Toronto as a national centre. To be sure, the year in which Phillips arrived in Winnipeg witnessed the establishment of a Civic Art Gallery and Museum at Main and Water Streets, and an affiliated Art School under the direction of Alexander Musgrove who was brought from Scotland for the position. An Art Club emerged the following year. 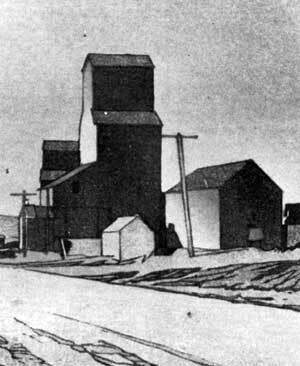 The commercial art firm of Brigden’s employed an impressive group of artists. While the number of good artists in Winnipeg was small, it did include Musgrove, Eric Bergman, the Brigdens, and later LeMoine FitzGerald and Franz Johnston. There was some patronage available, notably through collectors James MacDiarmid, WI. Bulman and A.A. Heaps, though their preferences were directed abroad. Yet, compared to Toronto, the infrastructure of art was thin and weak. Toronto had its established public gallery, at least four art organizations, a long-established art school, large commercial graphics firms, and major annual exhibitions at the Canadian National Exposition, and the Ontario Society of Artists, as well as biennial appearances of the Royal Canadian Academy exhibition. As important, it had wealth for both public and private patronage. Not the least of its advantages was its access to a vitalized National Gallery of Canada, which, while located in Ottawa, was under the commanding influence of a Toronto banker, Sir Edmund Walker, the chairman of its board. Toronto was, as Phillips was to learn, Canada’s “largest and most vociferous” art centre, so much so that, as he put it, “broadly speaking, Canadian art and the art of Toronto are almost synonymous terms for exhibition purposes.” An artist, like himself, who persisted in clinging to a habitation elsewhere, was “apt to lose a great deal in the way of recognition and its contingent amenities, publicity and patronage.” Recognizing Toronto’s dominance, he advised young artists that, if they are to consider their own interests, they “must gravitate in that direction.”  It was his own unrealized intention to move there during the hard times of the 1930s. The final, perhaps decisive, factor in Phillips’ reputation, contemporary and posthumous, was his subjects and style his art itself. At precisely the time that Phillips was settling in Winnipeg, the Group of Seven was emerging in Toronto as the major force in Canadian art, imprinting upon its mainstream a subject matter, a style, and an ideological ethos into which Phillips could only ambiguously fit. Phillips’ quiet perception of nature and man, that I attempted earlier to describe, stood in contrast to the view which the Group of Seven embraced and pushed to dominance. Gentle tranquility, intimate beauty, and man’s presence had little place in the Group of Seven’s terre sauvage conception of the nature of Canadian landscape. In the raw and unhumanized landscape of northern Ontario, they found “bold and massive” settings of “truly epic grandeur” where there was “no timid play of subtleties.” The landscape they selected was “rugged and stern”, “untamedperhaps untamable”. Man was conspicuously absent from this silent and solitary landscape. 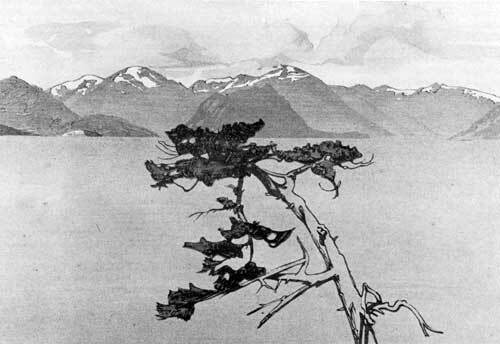 “This land”, Arthur Lismer wrote, “has never been tamed by man; it only puts up with man; man has no governance here.”  This view of nature was an aesthetic revolution in landscape perception. Although essentially new to painting, it appealed to the emotional needs of the newly urbanized upper classes of Toronto in a process of social and cultural interaction which I have dealt with elsewhere. More to my point here, is that it was an artistic revolution in which Phillips could be no more than a fellow-traveller. Conditioned by his own view of nature, Phillips stood apart from some of the basic postulates of the Group of Seven’s aesthetics of Canadian landscape. While his perception of nature and man and of their suitabilities as subject matter differentiated Phillips from the wilderness ethos of the Group of Seven, there was also a stylistic contrast which was symptomatic of a break which was occurring everywhere in the style and function of art. Since, roughly, Van Gogh, art was becoming increasingly subjective, increasingly seeking to express emotion or spiritual attitude. The subjective artist used painting as an outlet for his own internal moods and responses. The picture became something of a transcript of an inner condition while subject matter became of less importance than the painter’s expression or feelings about it. The Group of Seven, though it remained largely wedded to realism, was often as concerned with expressing and conveying emotion about its landscapes or in discovering their spiritual essence as in portraying what they actually looked like. Phillips recognized that and, because they were seldom very radical in it, he did not censor itbut it was not his way. He adhered firmly to an older aesthetic tradition which allowed for changes in style and perception but only within that objectivist tradition. Phillips stood firmly within that objectivist tradition which sought beauty through nature. His emotional sensitivity was to the external, to the beauty which could be found there by the percipient observer. In this he was not within the mainstream of art’s critical assessment. 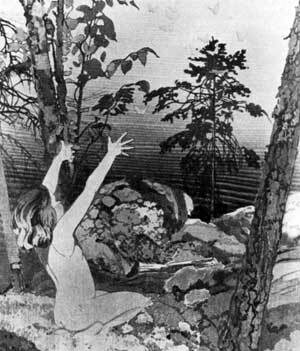 As Bertram Brooker put it, Phillips was “out of key with the whole art mood not merely of this country but of this time.” A really creative contribution to art, Brooker insisted, “must come through the awakened spirit and not through the conscious training of eye and hand.”  To such elevations of spirit over technique, training and tradition, Phillips could never agree. But he stood against the current of subjective expressionism and his reputation reflects it. Not at the cutting edge of the avant-garde, not even within that avant-garde, he was swept by critics and scholars into the eddies and backwaters even of Canadian art. Art criticism and art historical scholarship have had little respect for “laggards”. As James Ackerman writes, in modern criticism “the forces that make for change in art have been praised more warmly than those that make for stability.” The artist is admired more for his innovation than for his ability to sustain tradition. That this standard of judgement may itself be out of key with deeper intellectual currents of our time, that it may contain suspect assumptions of progress, that it is tinged with a whig interpretation, has not significantly weakened its pervasiveness. To Wilkin and Fenton, authors of the recent Modern Painting in Canada, their standard was to choose artists who “were instrumental, in some way in establishing modernor modernistpainting in this country.”  That basis for judgement ensures that Phillips is omitted. Such a criterion, together with Phillips’ conventional character, his choice of “minor” media, and his provincial location, determinedeven “overdetermined”that Phillips would be out of the mainstream. As an historian, my purpose is to explain and not necessarily to evaluate. I hope that I have explained in some measure the reasons why Phillips produced the kinds of pictures which are his and why his reputation remains minor Perhaps as important, I hope that this example of Phillips’ career and reputation tells us something about the nature of the Canadian mainstream, what made a mainstream artist and what hindered an artist from entering it. 1. Gay, Art and Act On Causes in HistoryMonet, Gropius Mondrian (New York Harper & Row, 1976) p. xi. 2. “This Man Leighton” undated clipping. Winnipeg Evening Tribune, Phillips clipping books, John Crabb collection, Winnipeg. 3. “Wet Paint,” p. 45 unpublished typescript. Crabb collection. 4. “Art and Artists.” undated clipping. Winnipeg Evening Tribune, Phillips clipping books, Crabb collection. 5 “Wet Paint.” p. 86. 9. Arthur Lismer, “Canadian Art,” The Canadian Theosophist, 5 (15 February 1925), 177-79; Lismer quoted in John A. B. McLeish, September Gale (Toronto: J. M. Dent, 1955), p. 186. 10. Douglas Cole, “Artists, Patrons and Public: An Enquiry into the Success of the Group of Seven,” Journal of Canadian Studies, 13 (Summer 1978), 69-78. 11. “Art and Artists,” undated clipping, Winnipeg Evening Tribune, Phillips clipping books, Crabb collection. 13. Ibid., pp. 70, 68. 14. Brooker, “The Arts,” undated clipping, ca. 1929. Phillips clipping books. Crabb collection. 16. (Edmonton: Hurtig with the Edmonton Art Gallery, 1978). p. 9.